Exquisite and innovative designs are translated into elegant jewel pieces by ardent passion and precision of the experienced and trained craftsman at Vibgyor Creations. 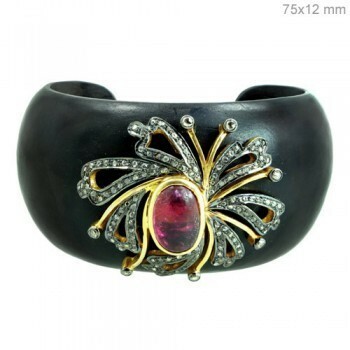 In the year 2009 Vibgyor Creations established itself as a jewellery manufacturer. Since then we are serving our customers with our new and innovating craftsmanship and unique designs. It is due to our dedication and hard work that today we are one of the leading jewellery manufacturer and exporters.It is only due to our customers satisfaction and their trust that we have made our presence in this leading world of jewellery. Established in Jaipur (India), the hub of gemstones and jewelry, Vibgyor Creations today, is a reputed. Wholesale jewelry manufacturer and supplier, that successfully caters to the ever-changing demands of the global market. Vibgyor creations is also one of the preferred designer jewelry manufacturing company, that design and cast jewel pieces with international quality standards like diamond earrings, bangles, rings, bracelets and many more with natural diamonds and gemstones. Our jewellery are beautifully created in silver(92.5) and gold with mind blowing and pretty precious and semi-precious colour stones. Before reaching to our customers our products has to pass and are tested in various departments like quality check, quality control, production management etc.